Kaedyn’s mom reports that his physiotherapist’s are super happy with the fact that his feet are correctly positioned and they can already see a difference. His Ankle Foot Arthotics which he received at the beginning of this year – funded by the Cycle Tour proceeds, have already begun to work at correctly positioning his feet which lessens the chance of muscle contracture. Kaedyn had outgrown his previous set of Ankle Orthotics when his mom reached out to us, we were really happy to be able to assist. Villiers Nel was a beneficiary of the Bumble Bee Fund a few years ago. As a young child he was diagnosed with Cornelia de Lange syndrome. 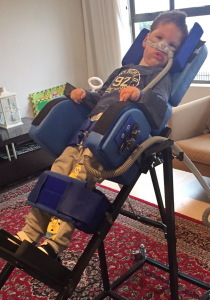 We were able to purchase him an Ottobrock Kimba Buggy to assist with his posture as well as a suction pump. This time around, we are in the fortunate position to be able to assist him with a 3d massager which will help to loosen his phlegm, which is a big challenge in his everyday life. We were really thrilled to be able to assist this family with improving young Villiers quality of life. Gabriel is a 14 year old boy with Spinal Muscular Atrophy. He uses a Madiba buggy for posture support as well as mobility. Due to his growth spurts he developed some severe scoliosis. It is very difficult for Gabriel to be comfortable in the buggy and as he grows, the device needs to be constantly adjusted. We assisted him in 2016 with regular adjustments to his buggy to ensure he stays as comfortable as possible. In 2017 Gabriel wasn’t able to go to school as he was so uncomfortable and in pain when he tried to sit up, hence he was home schooled. He missed going to school and seeing his friends and couldn’t wait to go back. 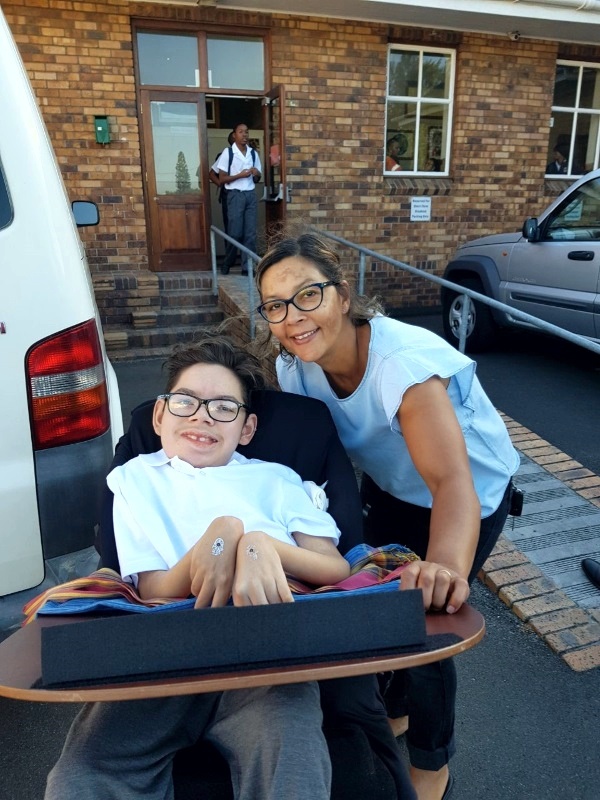 Thanks to our Cape Town Cycle Tour riders, Gabriel received his new customised Shonabuggy, which has allowed him to return to Vista Nova this year. 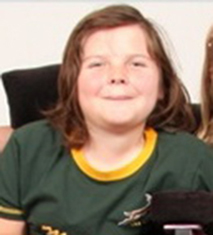 Christiaan lives with his mother and father and older brother in George. He outgrew his previous device and as a result was unable to sit in his previous wheelchair for longer than a few minutes without discomfort. This meant that for the last year he and his family have been unable to go out together as there has been no comfortable way to transport Christiaan. Thanks to the Bumble Bee Riders of 2018 Christiaan now has a custom fitted device, which means he is now able to sit for longer periods of time. He is able to still play his games while in the chair as well as eat and drink more comfortably. His family is so excited that they will now be able to go out as a family again and not have to leave Christiaan behind. Thank you to our riders for your continued support which helps children like Christiaan get back the ability to enjoy their life to the fullest. While out educating communities on the care of their animals, Leeann met Elfredo. He lives with his single mother and one sibling, as well as his grandparents and another young girl that they have taken in. Elfredo has been seen by therapists at Oudtshoorn hospital however it is too far for him to travel to the hospital for therapy. His mother and grandmother take care of him but not having a wheelchair that properly supported his body he developed significant kyphosis. 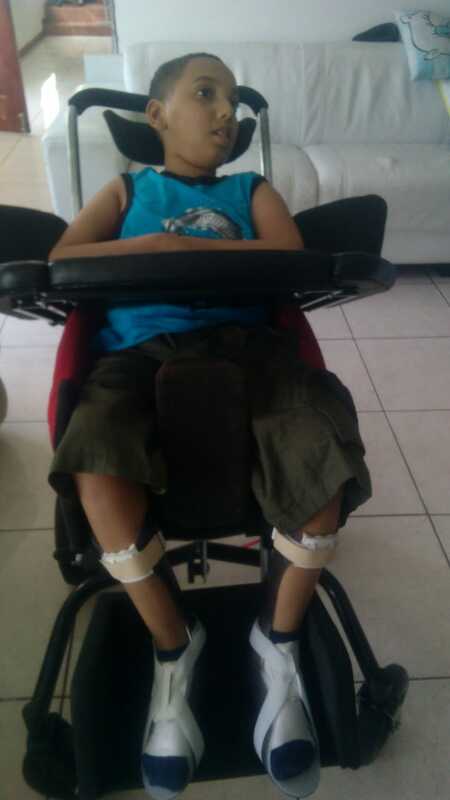 Receiving a wheelchair that supports his body and allows Elfredo to rest his arms on a solid surface will help prevent him from developing further contractures. 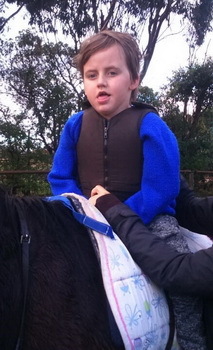 Once again a huge thanks to our riders who have changed this little boy’s life. Sipho lives in an informal settlement in Port Elizabeth with her mom and 2 siblings. She is 3 years old and has Down Syndrome and Cerebral Palsy. Her mom is single parenting and unemployed but Sipho has medical aid through her dad. She was assessed by a therapist who recommended a Madiba2go Buggy. Medical aid paid just over half the price for the buggy, however her family was unable to afford to pay the remainder. Thank you to the Cape Town Cycle Tour riders who have been super heroes and paid the balance so that Sipho can get the buggy she needs. 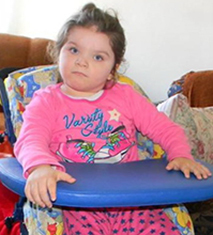 Ilana has Cerebral Palsy which affects her legs more than her upper extremities. She has increased muscle tone in her legs which prevents her from sitting, standing and walking independantly. She was in need of a new wheelchair to accomodate her needs. Thanks to the generous sponsorship from the Cape Town Cycle Tour riders we were really excited to be able to assist Ilana with a new comfortable and more practical chair. Bajongile is 22 years old and has Cerebral Palsy. When he is at home he crawls around on his knees and if he needs to go to the clinic his mom carries him on her back. 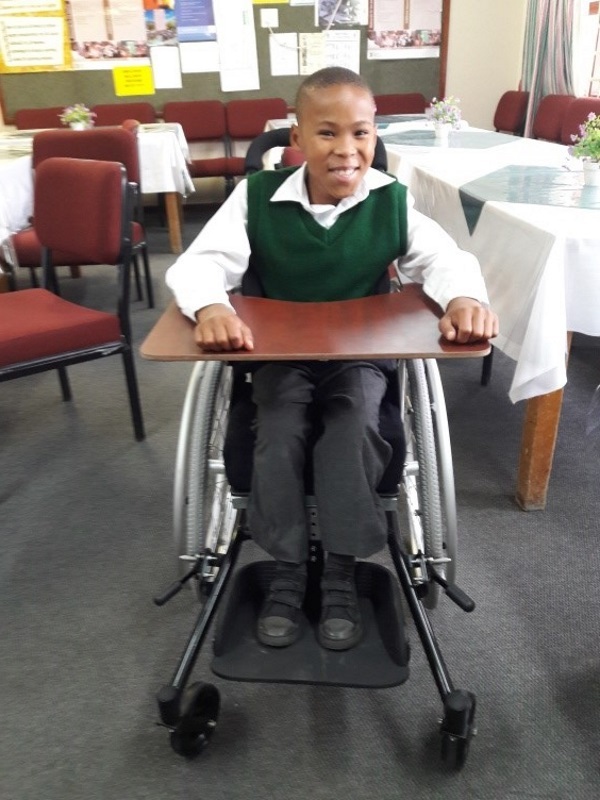 Pupils from Holy Cross school raised funds to assist Bajongile to get a wheelchair, however they were just short of the target needed. Thanks to our supporters, the Cape Town Cycle Tour riders, for raising the balance of funds needed so that Bajongile now has his own chair. His whole class were involved in the explanation process:- how they can assist Eldino when he wants to use the tray on his wheelchair instead of sitting on a hard wooden bench in class. This has also given his classmates an opportunity to learn about inclusiveness and how they can show compassion and provide him with help. Eldino told the therapist who fitted his chair on delivery day that he would like to work in the Shonaquip factory one day and make other people wheelchairs! Without the assistance of our supporters, the SA Institute of Steel Construction, Eldino may not have had the much needed boost that he has been given. 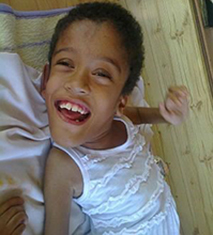 Zahria is a 7 year old girl with Spastic Quadriplegia and Thoracic-lumbar kypho-scoliosis. She is a fun loving and cheerful little girl who loves music. Her favourite toys are the ones where she can press a button and they play music. She also likes to bang a rhythm with her hands on her table especially when her dad is playing guitar for her. 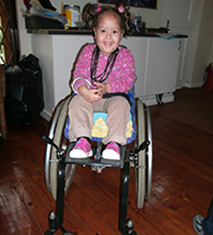 Thanks to our Cape Town Cycle Tour riders, Zahria is loving life in her new wheelchair. 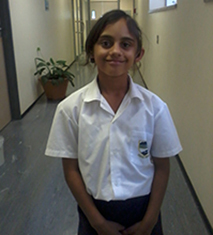 Ielyaaz is a learner in Grade 2 who suffers from Spinal Muscular Atrophy, Type 2. He comes from a disadvantaged background with a very supportive family. 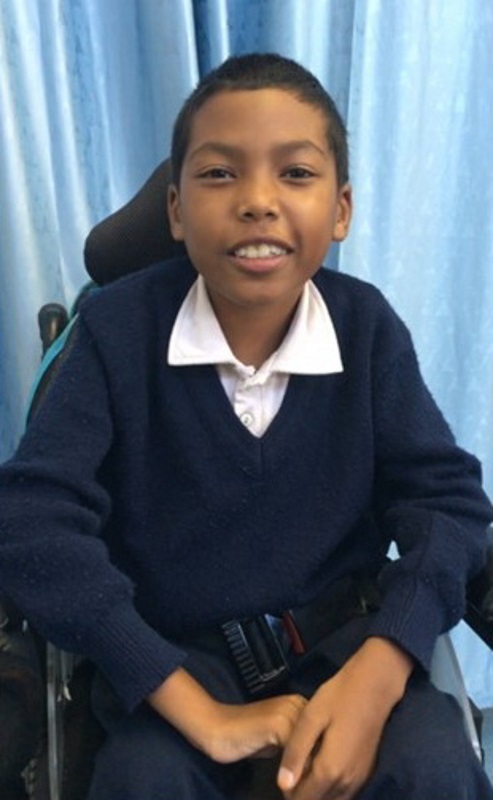 His mom is not able to work as she needs to look after him when he comes home from school and when he frequently misses school due to being ill. We have been blessed by our supporters to be able to give Ielyaaz a motorised wheelchair for school. Ielyaaz’s face lit up with the biggest smile when he was given the chair. He is over the moon and loving it! Herman loves books, balls, balloons and playing baby games on the tablet. This gorgeous little guy struggles with motor function. He has been classified as a 4-5 on the GMFCS (Gross Motor Function Classification Scale) and needs his buggy to sit and move. Despite his challenges Herman has shown improvement against all odds. We were thrilled to be able to help Herman with his Shonaquip buggy by suppling a new headrest, arm rests and seating cushion. Herman is now sitting more comfortably. Hanno is loving his new electric wheelchair. Thank you CTCT riders for helping to make this a reality! Hanno suffers from Spinal Muscular Atrophy Type 1. He cannot crawl, walk or breath without the aid of a ventilator. His new wheelchair has given him the opportunity to decide where he would like to go without having to wait to others. This independence has his self-confidence at an all-time high. We are thrilled to see this cheerful, fun-loving guy enjoying zooting around on his own steam. This cheerful, fun loving little guy loves his hippotherapy sessions. This therapy has been crucial to helping Sammi overcome some very serious physical challenges around his low muscle tone. After the medical aid could no longer commit to paying, Sammi was unable to continue with his therapy due to financial constraints. Now Sammi is back on the horse and loving it thanks to Kerston Foods for their generous donation to the Bumble Bee Fund and the difference that has made to Sammi and his family. To all our CTCT riders, a huge thank you for Zena’s wheelchair! 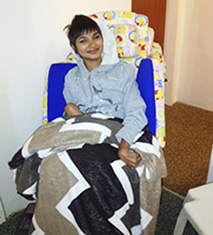 The Bumble Bee Fund was able to purchase her fabulous new chair with the funds you raised. Zena is 15 years old and suffers from Spina Bifida and due to that she presents like a paraplegic, she is not able to walk, stand or do standing transfers. She is academically strong and super sporty. She is part of the Western Province sports team for field events such as shot put, discus, javelin and this year she is once again going to the National Games. 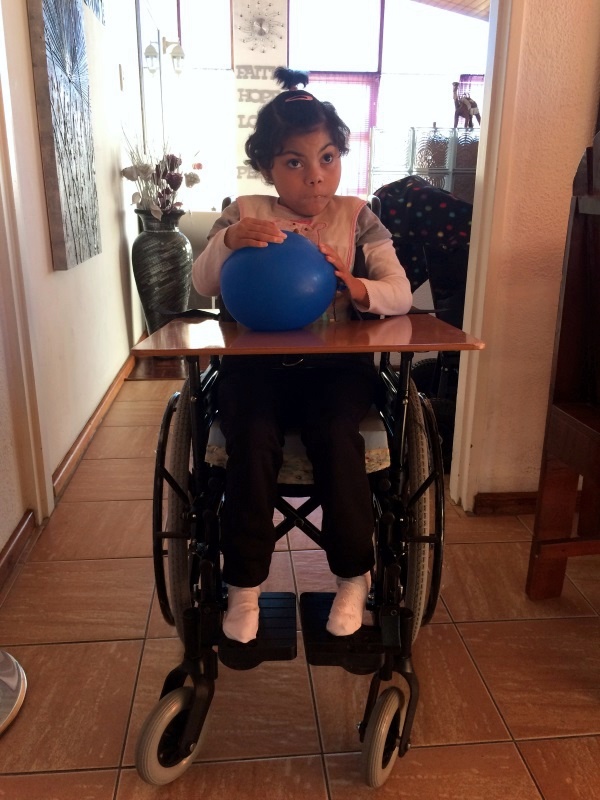 With your help funding her wheelchair and Zena’s dedication we see her going far! Villiers is a delightful 10 year. 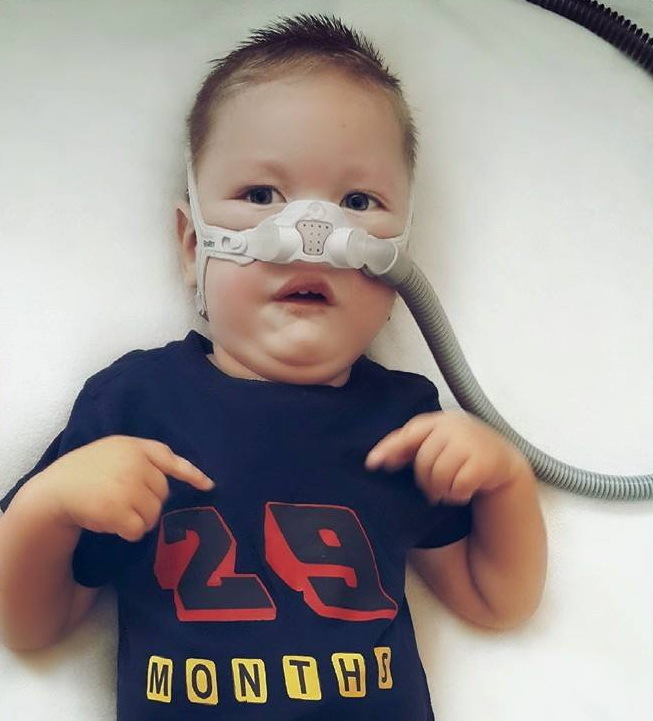 Born at 38 weeks weighing 1.65kg, he spent his first month in hospital and was later diagnosed with Cornelia de Lange syndrome. Cornelia de Lange syndrome is a developmental disorder that affects many parts of the body. It is characterized by slow growth and intellectual disability that is usually moderate to severe. In Villiers case he can’t walk or speak and has a feeding tube in his tummy for special feeds as he struggles to swallow. He suffers from recurrent chest infections and is regularly hospitalised. 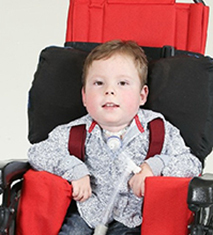 Villiers is the sweetest little boy despite his struggles and when he outgrew his pram recently, the Bumble Bee Fund were thrilled to be able to purchase a Ottobock Kimba buggy with posture support for him as well as a suction pump. Stephani is a loving, busy child. She is one of a twin and she has been diagnosed with Alternating Hemiplegia of Childhood. AHC is a rare neurological disorder in which repeated attacks of hemiplegia (paralysis of a portion of the body, including the face) occur, usually affecting one side of the body or the other, or both sides of the body at once. At times this leads to Stephani experiencing full loss of feeling and movement, in other words paralysis of her whole body. Despite this she is always eager to learn and move around. 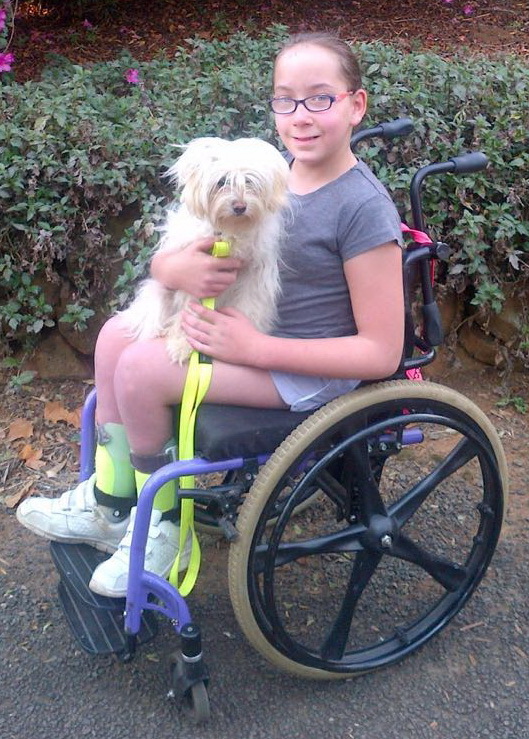 To make her life less challenging, it was decided that a walker would be best for Stephani. 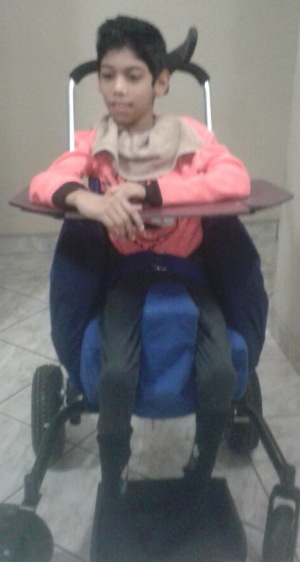 Using funds raised by our CTCT cyclists we were able to purchase a Shonaquip CP walker for her. Thanks for mobilizing Stephani, so she can keep exploring and zooting around the house. Wessel was first diagnosed with cerebral palsy, but then his progress showed that there was something else wrong. After various tests, he was diagnosed with Vanishing White Matter Disease. VWMD is a devastating genetic, degenerative, brain disease that amongst other things causes loss of motor function. 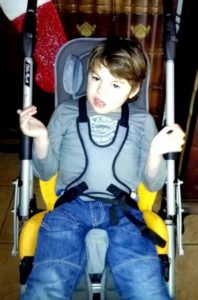 Wessel has lost his ability to walk and after researching the best solution to help with his mobility his parents bought him a Maxi rehab stroller from Sitwell Technologies. With the help of our Cape Town Cycle Tour riders and the funds they raised we were able to help Wessels parents with the cost of his stroller. Meet Antoni! He is 7 years old and has Cerebral Palsy. Antoni was born struggling to breath and was deprived of oxygen shortly after birth. Despite this he has astonished all around him by making excellent progress. He has many challenges, one of which is his trachea tube which helps him breathe more easily. He cannot walk and is non-verbal, but he always has a smile. Antoni needed a stroller to help move around and to prevent scoliosis. We are so pleased to have been able to help with the cost of a Clip 2 Stroller for Antoni. Dennis suffers from Duchenne Muscular Dystrophy. 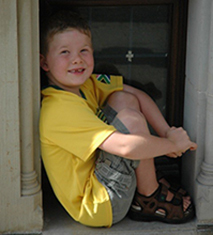 DMD is a rapidly progressive form of Muscular Dystrophy that occurs primarily in boys. Dennis was struggling to get comfortable in his old wheelchair as it was too wide and the seat depth too short. The backrest also neglected to provide the required support. Even with this discomfort, Dennis never complains and tackles life with a positive attitude. The Bumble Bee Fund along with Dennis’s family purchased a new folding frame manual wheelchair with a long seat as well as both recline and tilt for Dennis. We are so pleased that he is now sitting more comfortably! 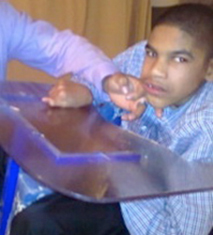 Jameil is a 13 year old bubbly little boy diagnosed at 6 months old with Cerebral Palsy. He has had no back support and very little head support and was in desperate need of a Madiba buggy to help with his posture. Even with all his challenges he still manages to smile and is a very happy child. Thanks BBF riders 2016! Thanks to your efforts on and off the bike Jameil now has his buggy/wheelchair! Gabriel is a 12 year old boy with Spinal Muscular Atrophy. 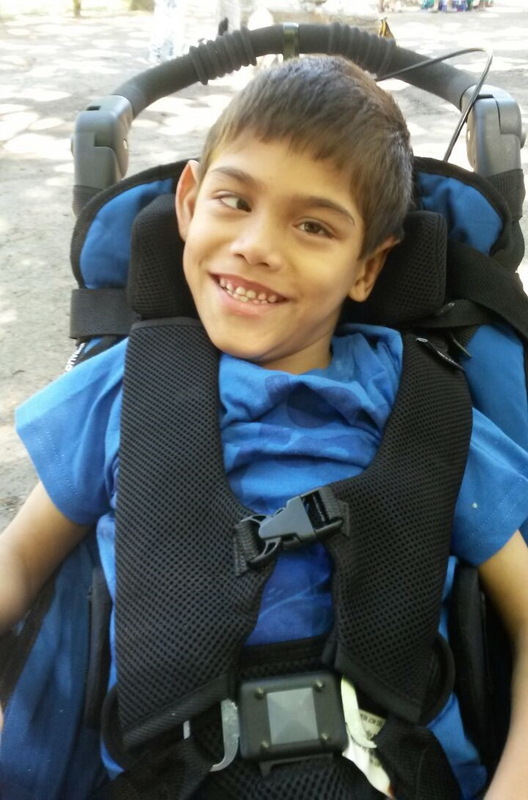 Gabriel is a very vibrant, friendly and caring young boy and is a typical 12 year old and loves playing playstation. He also loves watching Discovery Channel and National Geographic so he is a fountain of knowledge. 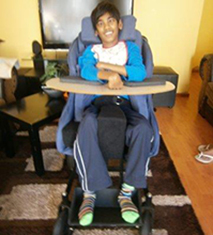 Gabriel uses a Madiba buggy for posture support as well as mobility. Due to his growth spurts he has developed some severe scoliosis. It is very difficult for Gabriel to be comfortable in the buggy and as he grows and develops, the device needs to be constantly adjusted. Thanks to our Cape Town Cycle Tour riders we were able to pay for Gabriel to have regular adjustments to his buggy and ensure he stays as comfortable as possible. Despite his severe physical disabilities, Gabriel always makes the most of life, he enjoys every moment and has a great sense of humour! Mikayla was born prematurely at 32 weeks. 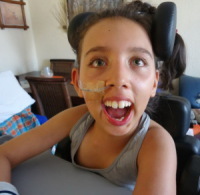 She spent 6 weeks in hospital and was diagnosed with Cerebral Palsy. 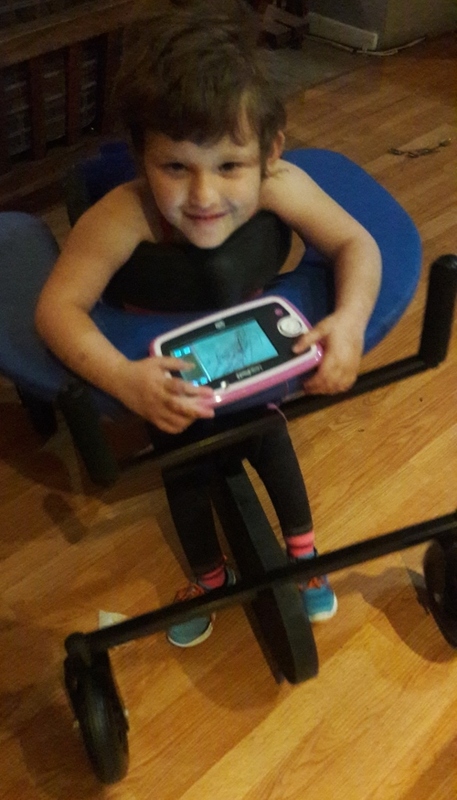 This little warrior is healthy despite her Cerebral Palsy and has regular physio, occupational therapy and speech therapy. Thanks to the group of eight runners who decided to enter the Two Oceans Half-Marathon to raise funds for the Bumble Bee Fund. Their efforts raised enough funds to buy Mikayla a standing frame. Abby has Spina Bifida and Hydrocephalus. She is cheerful and enthusiastic and is one brave courageous young lady. 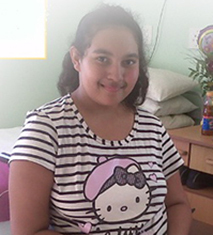 She recently travelled to Cape Town to have spinal surgery to correct scoliosis. The Bumble Bee Fund is pleased to have been able to help by hiring a hospital bed for her recovery away from home. 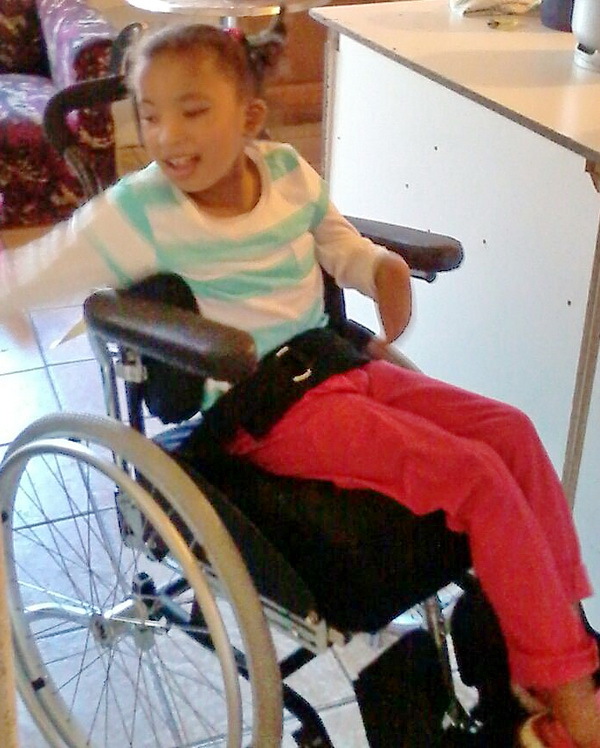 Seven year old Aqueelah suffers from Spina Bifida. She faces some difficulties as she has never taken weight on her lower limbs and suffers from low bone density and frequent fractures. 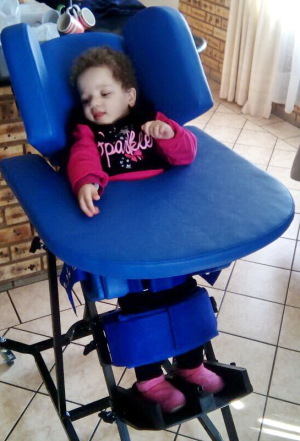 It was recommended that she get a “Snoekie” which is a standing wheelchair that will allow her to stand up, take weight on her lower limbs and increase the bone density and still allow her mobility. 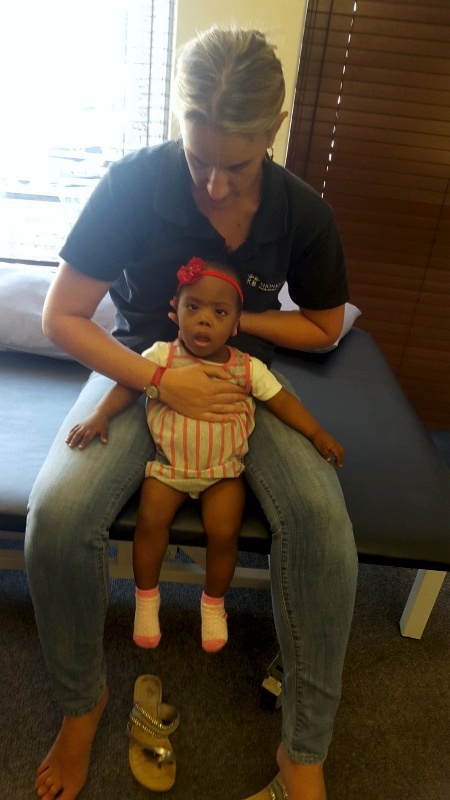 Thanks to a group of eight friends who entered the Two Oceans Half-Marathon to raise funds for Aqueelah, she is now mobile and loving her new independence. In July 2004 Celina fell into a swimming pool and was without heartbeat, pulse or breathing for about 35-40 minutes. Her heart started beating again and she spent 3 months in hospital. She lost her speech and mobility. She has since been diagnosed with Cerebral Palsy. Celina has an open bite meaning she can’t bite her teeth together or close her lips. With that eating, drinking, swallowing are very difficult. The Bumble Bee Fund covered the amount that the medical aid won’t cover making it possible for Celina to go for the surgery she needs. Thanks to our CTCT Cyclists there’s a big chance Celina will be able to develop her speech again. 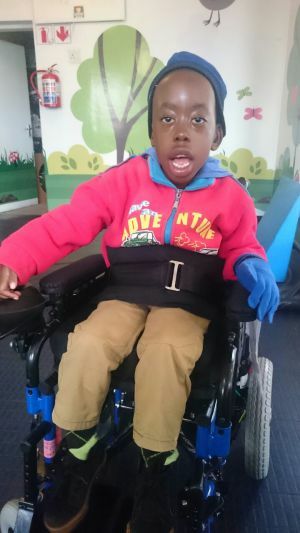 Nthando has Spinal Muscular Atrophy Type 2 and can no longer push his manual wheelchair. He is in grade 1 and his wish was to have some mobility and independence. The Bumble Bee Fund ordered his electric wheelchair and he loves it and the freedom it brings. 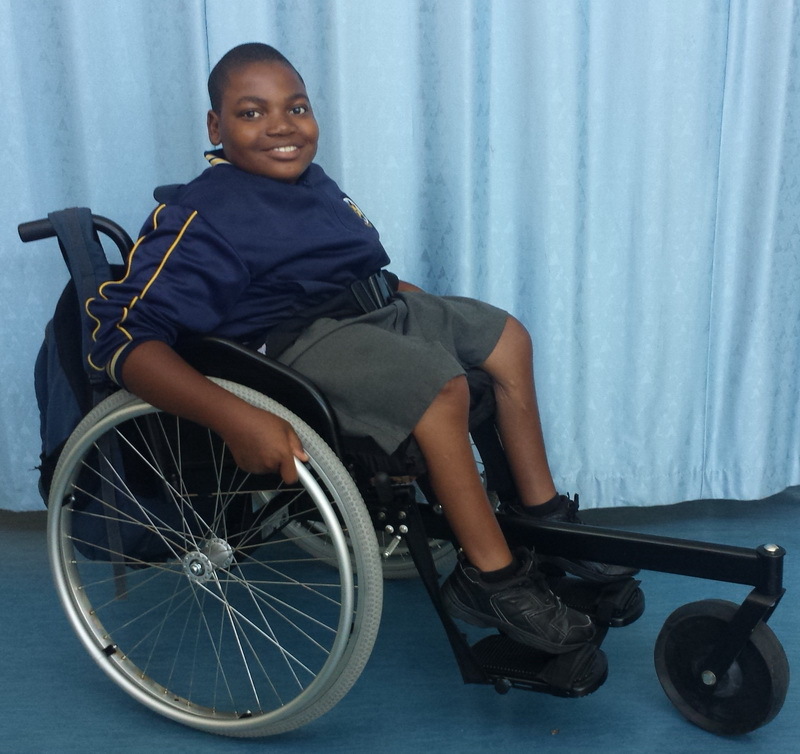 Nthando’s wheelchair was funded from the proceeds collected by our CTCT Bumble Bee Riders. Thank you to our cyclists for your care and support. Hanno is a true inspiration to all those around him and he keeps on smiling all the time! Diagnosed with SMA (Spinal Muscular Atrophy), he spends 24 hours a day on a ventilator and is fed through a small tube in his stomach. Although Hanno can’t sit, stand or walk he is a bright and intelligent child. 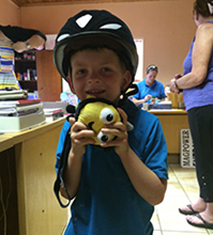 Having just turned 5 years old he is keen to start learning and with the help of our Bumble Bee 2016 cyclists we were able to buy Hanno some amazing educational software. Britney has Osteogenesis Imperfecta (Brittle Bone Syndrome) and as a result she is extremely fragile. She was in need of a motorised chair as her current one was way too small and falling apart. 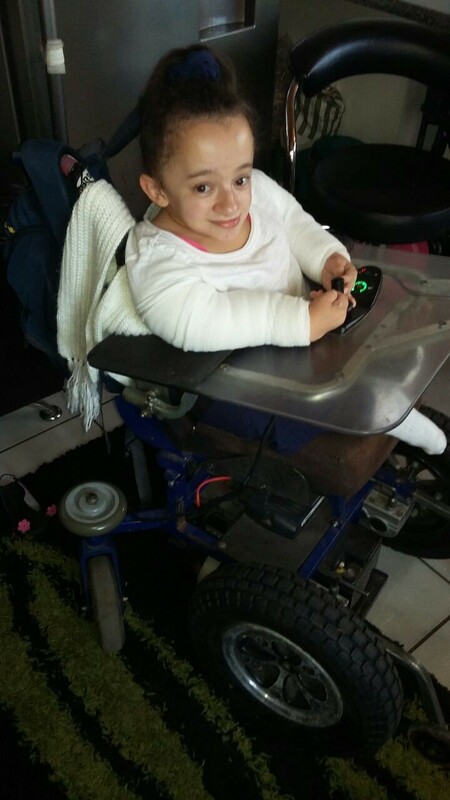 Thanks to our CTCT Bumble Bee Riders 2016 and the funds raised by the SA Institute of Steel Construction in Cape Town, we were able to buy Britney a new motorized wheelchair. Britney loves her new chair and being able to zoot around with friends. Kudakwashe has been diagnosed as a spastic quad with Cerebral Palsy. He is four years old. He cannot sit unsupported. He cannot craw or walk. He can lift his hands and legs and now makes a lot of sounds. 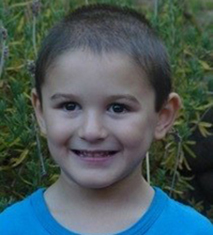 He is an ever smiling and friendly boy who enjoys music and likes to “dance”. Thanks to our Bumble Bee cyclists 2016, we were able to help Kudakwashe attend the Friends Day Centre in Maitland. Friends Day Centre is a NPO which provides appropriate education, personal skill development and an array of therapies for learners with severe and profound intellectual and physical challenges. Oratile has Congenital Myopathy, a condition when all muscles are very weak. He is not able to walk or stand. 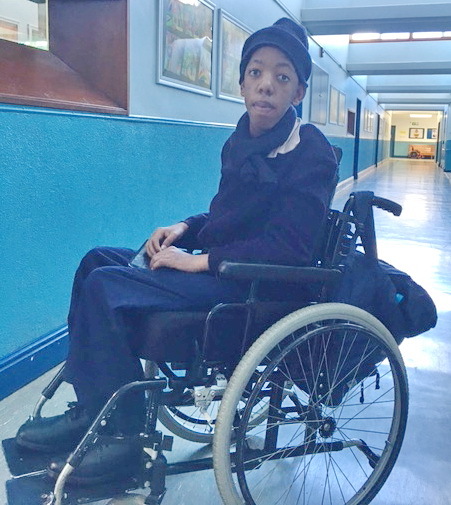 He has a motorised wheelchair at school but desperately needed a manual wheelchair for home, as the motorised chair cannot be transported between home and school. 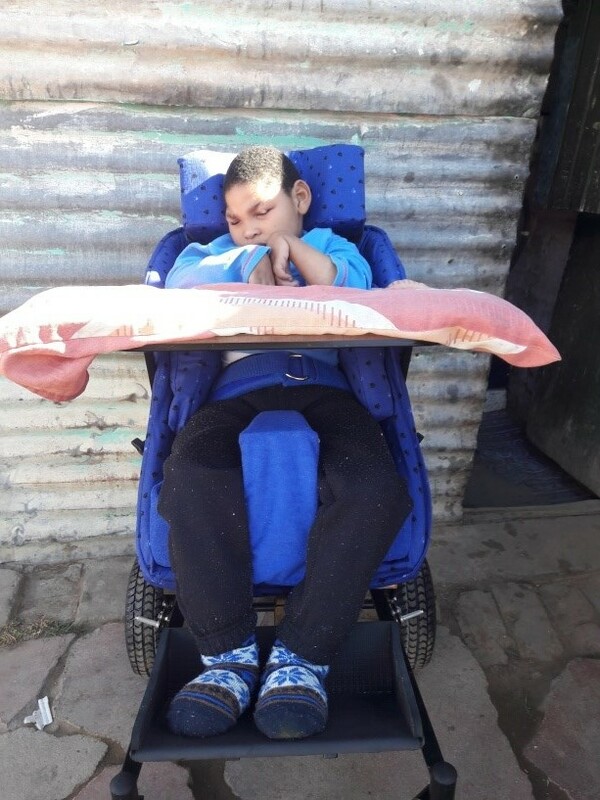 Thanks to funds raised by the SA Institute of Steel Construction during their Steel Awards dinner 2015 the Bumble Bee Fund was able to buy Oratile his much needed chair. Riley, aka Smiley Riley, has Spinal Muscular Atrophy Type 1. He is almost four years old and is unable to lift his head, arms or legs. He has a feeding tube in his stomach as he struggles to swallow. 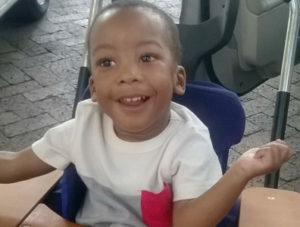 Riley is unable to talk and has gradually lost his ability to pull off his famous smile due to muscle weakness in his face but has no trouble letting his parents know that he is in fact happy. This brave little warrior has touched the hearts of many. 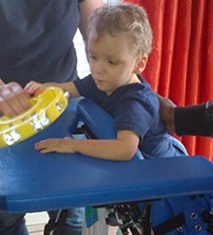 Thanks to our Cape Town Tour Cyclists 2015 the Bumble Bee Fund was able buy Riley a standing frame giving him the opportunity to bear weight on his legs and stand which he has never been able to do. Caleb suffers from Cerebral Palsy, Epilepsy and is a spastic quadriplegic. He needs trunk support and assistance to sit up. 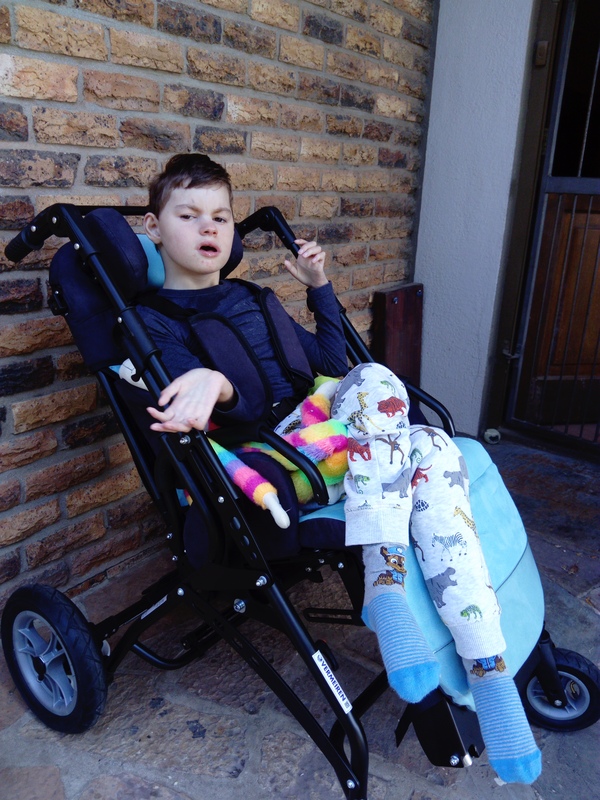 The Bumble Bee Fund bought Caleb a Madiba buggy/wheelchair which has provided him with the support he needs as well as an opportunity to interaction with his family and peers. Madison is diagnosed with Cystic Fibrosis. The Bumble Bee Fund hosted a Ladies High Tea for Madison. The afternoon which was organized by Madison’s friends was a huge success. All proceeds made on the day went towards the high costs associated with the specialized milk, supplements and medication Madison needs on a daily basis for the treatment of Cystic Fibrosis, a degenerating life long condition. Liam is diagnosed with SMA – Spinal Muscular Atrophy Type 1. He can’t sit unsupported, crawl, walk, hold his head up or lift his legs. He has little movement in his arms. He can hold light objects in his hands. Liam may not be able to talk but his parents have learnt to understand what he wants and doesn’t want. Liam enjoys being outside, swimming, bath time, watching Barney and Teletubbies. He loves company and being entertained. Liam, is a strong willed warrior. Liam can not cough effectively and was in desperate need of a cough assist machine to prevent lung collapse. 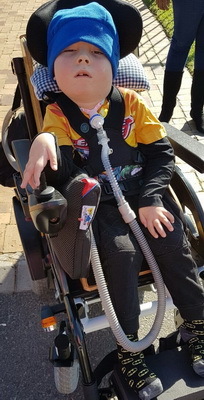 Thanks to all the money raised through the Ice Bucket Challenge inspired by Riley Austin, Q & L Projects for their donation and to all our 2015 Cape Town Cycle Tour Bumble Bee Riders, we were able to buy Liam a cough assist machine. Caitlan is a gorgeous three year old who survived a near fatal drowning when she was just 22 months old. She has difficulty with the alignment of her feet and was struggling to stand in her standing frame. The Bumble Bee Fund helped out with AFO’s – Ankle Foot Orthotics to stabilize her feet. Taro suffered from lack of oxygen at birth, he was born completely blue and lifeless. He wasn’t breathing on his own so the doctors started working on him immediately. 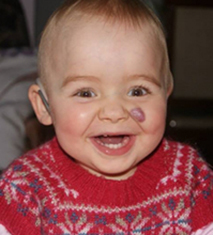 At 10 months old he was diagnosed with Dyskinetic Athetoid Cerebral Palsy. Today Taro is a beautiful, friendly little boy, despite his disability. Doctors are confident that he might be able to walk one day, but he will initially have to make use of equipment to improve his balance and strengthen his muscles. He will also require intensive therapy for a long time to come. It is difficult to know what challenges he will have to overcome. To help this brave little guy on his way, the Bumble Bee Fund bought him AFO’s. Ankle Foot Orthotics – These semi-rigid L-shaped braces extend up the calf and stabilize both the foot and ankle to bring muscles and joints into alignment helping Taro to stand in his standing frame. Timina suffers from Cerebral Palsy. She is 22 months old and was born at 27 weeks weighing just 735g. Timina spent her first 3 months in ICU and continues to fight every day for growth and development. To raise the funds needed for a Madiba 2 Go buggy, the Bumble Bee Fund held a ladies tea and raised R6900. A huge thanks to all who attended making it possible to help Timina and her family. Has suffered from two stokes and is paralysed on her left side. She uses a pram at home and a borrowed adult wheelchair at school. The Bumble Bee Fund was able to help Annastacia with funds raised by the SA Institute of Steel Construction during their Steel Awards dinner 2014 in Cape Town. 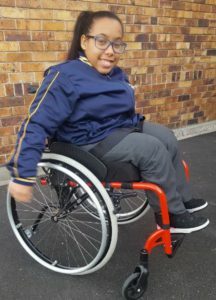 Annastacia now has a Sam Posture wheelchair that is just perfect for her petite size. 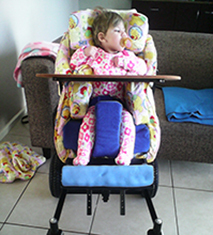 This fold up chair will make it possible for Annastacia to use it at home and at school. Watson who suffers from Bruchers syndrome, a rare syndrome which consists of a combination of Osteogenesis Imperfecta (Brittle Bone disease) and Arthrogryposis has melted the hearts of all around him and does not take anything for granted in life. 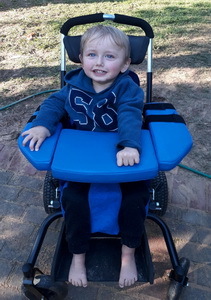 As he has outgrown his current wheelchair, The Bumble Bee Fund is supplying him with a Motivation Rough Terrain chair. We wish him all the best as he uses his new wheelchair to catch the My City bus to the nearest pick-up point for school. This gorgeous little girl has Spinal Bifida and has outgrown her wheelchair. The Bumble Bee Fund was able to help her with funds raised by the SA Institute of Steel Construction during their Steel Awards dinner 2014 in Cape Town recently. 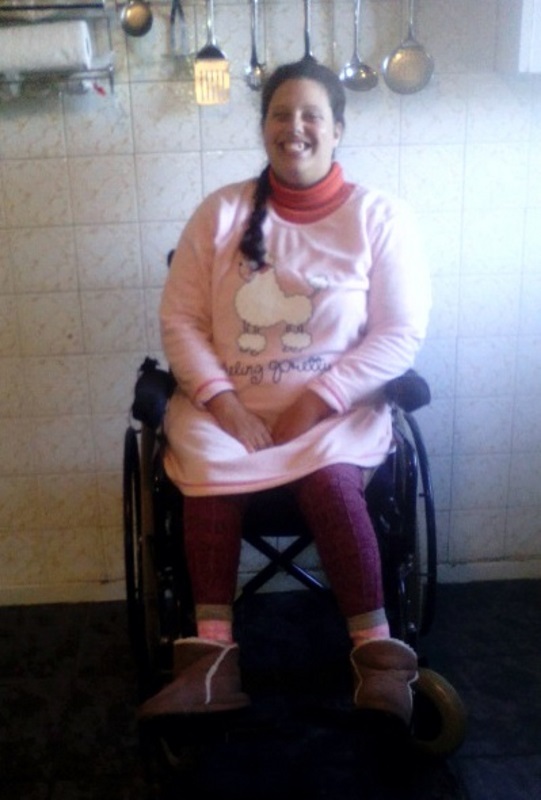 A huge thank you to them for making funding Amina’s new Ronny posture wheelchair possible. Adam was born at 27 weeks weighing only 620g. He has been diagnosed with Cerebral Palsy and is a Spastic Quadriplegic who is non verbal with limited head control. He is also the happiest little guy around! 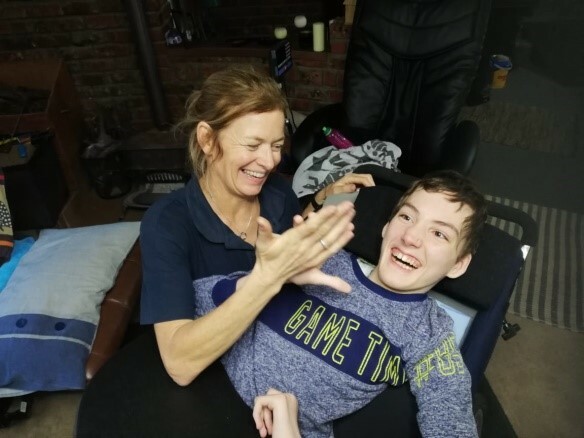 Adam has outgrown his buggy as it no longer offers his body sufficient support.The Bumble Bee Fund is delighted to have bought Adam a Tilt-in-Space Rodeo which he desperately needed. Zaiden Howie was born 8 weeks prematurely by caesarean section. He only weighed 1,7kg and had to spend his first month in ICU. Zaiden had his first stroke while still in the womb and this has lead to many complications that he is still fighting today. The Bumble Bee Fund bought Zaiden a horse riding helmet so he can continue horse riding which he loves, is essential and helps him physically. This gorgeous little guy has a special place in many hearts. Allegra was born at just 22 weeks gestation, weighing a mere 500g. Her first three days she spent in a plastic zip lock bag to keep her skin moist. 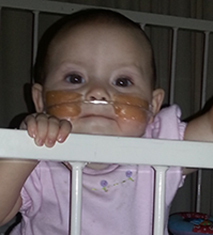 Allegra became a real miracle baby and the youngest preemie in SA that ever survived. Just before her 1st birthday, she was diagnosed with Auditory Neuropathy and has since had a cochlear implant. The Bumble Bee Fund hosted a ladies tea for Allegra and raised R10 000 which has been spent on replacing the expensive batteries for Allegra’s cochlear implant. Even though Allegra had such a rough start, she is always happy, friendly and has such a positive spirit. Karli is a gorgeous little girl, who due to complications during pregnancy and birth, is blind and suffers from Cerebral Palsy. 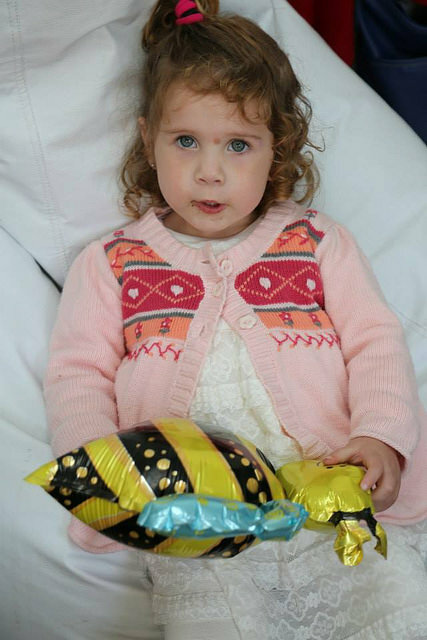 The Bumble Bee Fund held a dinner at Den Anker restaurant to raise funds for a buggy for Karli. We are sure it will make a huge difference to this friendly, beautiful baby, who loves cuddles and kisses. Shanelle an amazing young lady, who loves life. She is severely physically disabled, being a spastic quad but is extremely intelligent. She is the centre of the family and her smile lights up the room. Shanelle and her family are extremely grateful for the buggy the Bumble Bee Fund has supplied and they say it has changed Shanelle’s life. This delightful little boy is unable to walk and struggles with his fine motor skills. 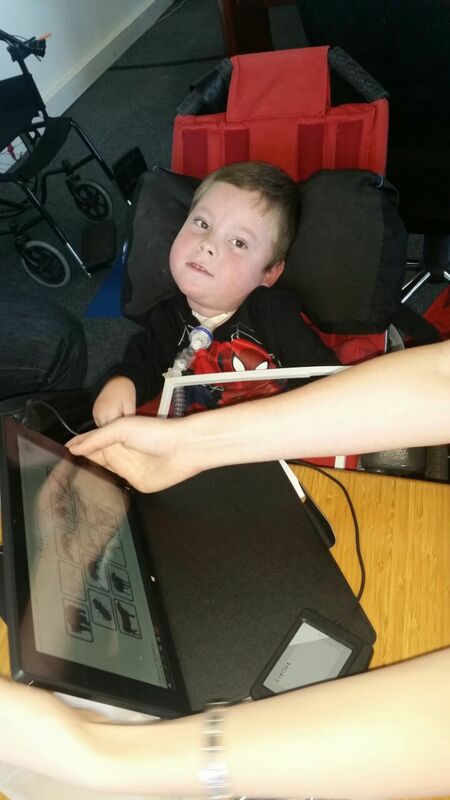 The Bumble Bee Fund bought him an Ipad to help with his learning. He loves it and it has been a wonderful tool, making it so much easier for him. Jeremiah is 12 years old and is a really sweet young man. Despite being severely physically disabled and unable to verbally communicate, he is very aware of everything that goes on around him. 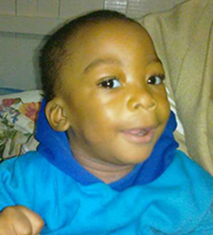 The Bumble Bee Fund supplied Jeremiah with a Shonabuggy and now he is able to sit comfortably and with good posture. His mom is super excited to be able to take him out and about! Cole has Congenital Muscular Dystrophy a disorder resulting in progressive wasting and weakness of the muscles. Cole has never walked and is just recovering from a spinal operation. 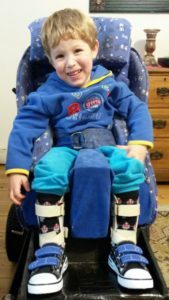 This determined young man needed a specialised supportive car seat which the Bumble Bee Fund was pleased to be able to help with. This has made it much easier to get Cole in and out the car and given him the support needed. 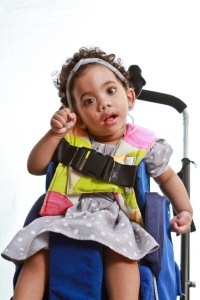 Isabella has Cerebral Palsy, is Tri-plegic, Aspastic, her vision and hearing are impaired. She had a tendon lengthening operation and her burning desire was to be able to stand and walk. The Bumble Bee Fund purchased a walker earlier this year and now she has the support she needs. Veronique has been diagnosed with Cerebral Palsy, Spastic Quadriplegia, Hydrocephalus and Epilepsy. As she has gotten quite heavy for her mom to carry her around, she was thrilled to receive a Madiba buggy from the Bumble Bee Fund earlier this year. 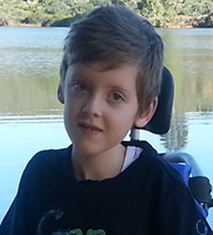 Jayden has alternating Hemiplegia of Childhood. The one side of his body is more effected than the other and without orthotics he was struggling. We are pleased that Jayden is off and away and all set with his new orthotics from the Bumble Bee Fund. David diagnosed with Downs Syndrome has many challenges. The Bumble Bee Fund purchased knee braces for him and now he is able to run and keep up with his siblings. Kuda suffers from Cerebral Palsy. This gorgeous young man is eighteen months old and in desperate need of a Shonabuggy. 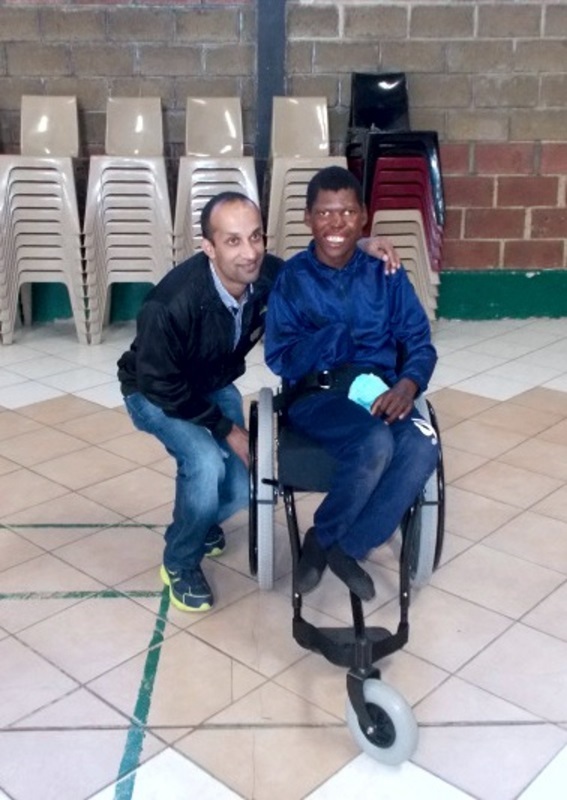 Thanks to our Cycle Tour riders we were able to buy Kuda his buggy/wheelchair. 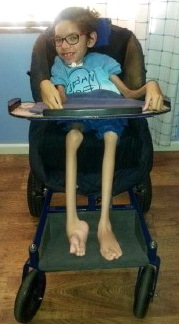 He is now able to be moved around with the correct body support and he and his family are delighted. Keanu is a courageous little boy that inspires everyone he meets. He was a prem baby and as a result was born deaf and blind. This influenced his development severely and he is unable to crawl or stand. The Bumble Bee Fund is pleased to have been able to supply him with a much needed standing frame. Qaylah is a bright little girl who always shows determination and tenacity in all she does.Although she was born deaf, she has embraced her disability by showing others that nothing should hold you back. When Qaylahâ’s cochlear sound processor needed to be repaired the Bumble Bee fund covered the cost. Diagnosed with Lissencephaly and West Syndrome is a beautiful 5 year old with the development of a 4-6 month old. She surprised everyone one when she started sitting upright at the age of two. Nikitaâ’s parents wish is to help there daughter stand and perhaps start walking. 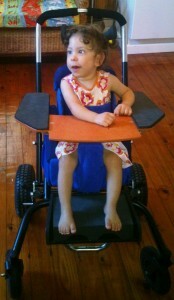 To help her on her way the Bumble Bee Fund bought Nikita a standing frame and Shonaquip buggy/wheelchair. 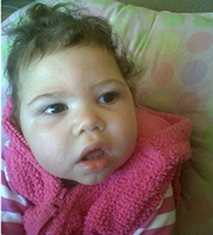 Is a gorgeous 15 month old who suffers from Cerebral Palsy, Spastic Quadriplegia and Epilepsy. 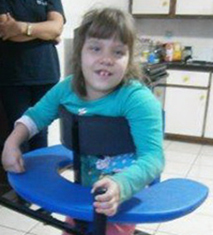 The Bumble Bee Fund bought Isabella Ankle-foot orthotics, a standing frame and a Quickie Breezy wheelchair. 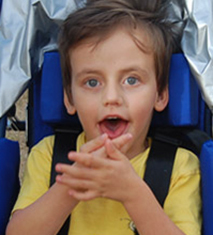 Diagnosed with Spinal Muscular Atrophy, Hanno’s parents feel privileged to have him as their son. He has recently had a Trachea inserted to help him breath and a Peg tube inserted to feed him as he is unable to swallow on his own. Hanno who is 20 months old needs medical equipment so he can leave the hospital and be looked after at home. The Bumble Bee Fund bought the special formula Hanno needs everyday. Suffers from Metabolic Disorder which affects her digestive system. She needs to be fed through a stomach tube and requires 24 hour nursing care. This gorgeous little girl spent her first year in hospital. As she suffers from severe food aversion, malabsorption and various allergies her medical and daily caring costs are huge. The Bumble Bee Fund has helped out by buying Reani her special feed. Is an inspiration to all round her. She recently contracted Guillain-Barre syndrome and has been wheelchair bound ever since. The Bumble Bee Fund donated towards appropriate transport to get Brooke to and from school. Is a delightful 3 year old with a big smile and an infectious giggle! He has an undiagnosed neuro-muscular disease and cannot stand or speak. Sammy’s life has changed in a BIG WAY since he got his standing frame. It’s unbelievable to see how a whole new world has opened up to him since he has been able to stand. 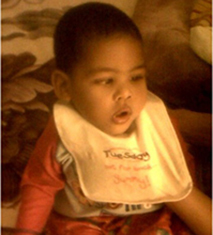 Is a sweet loving 21 month old little boy who suffers from Cerebral Palsy. He is unable to talk or sit and desperately needs a specialised chair to help him sit. 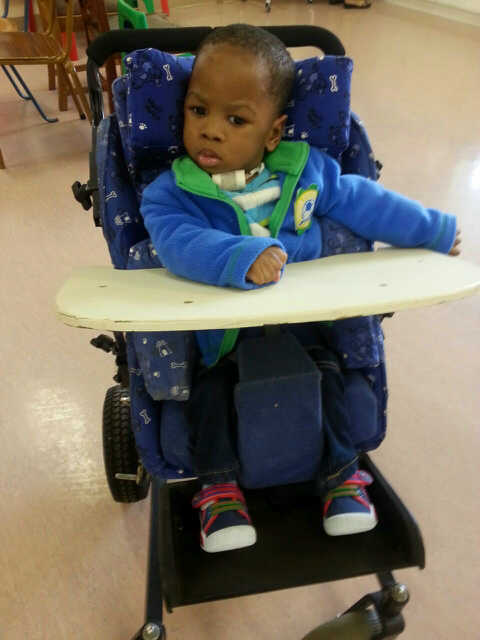 The Bumble Bee Fund bought Jayden a much needed Shonaquip buggy/wheelchair. Kyle is a seventeen year old quadriplegic who cannot speak and who is hearing-impaired. He has outgrown his Shona buggy wheelchair making it impossible for him to see and enjoy the environment around him. 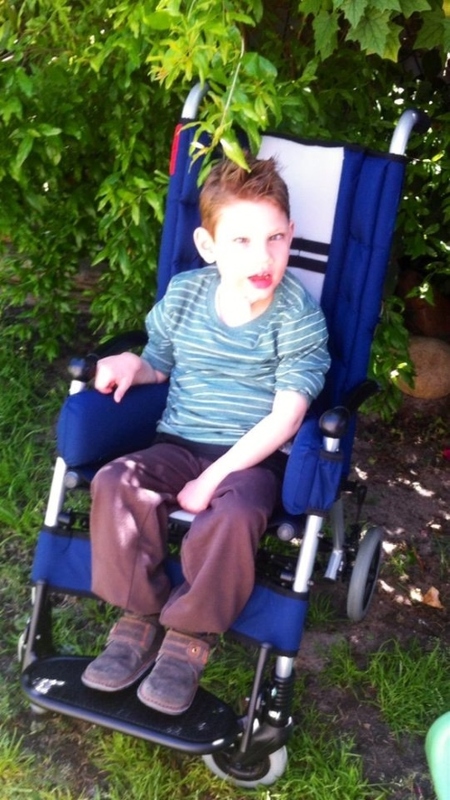 The Bumble Bee Fund raised funds to provide him with a new Shonaquip buggy/wheelchair. In most respects Daniel is a regular little boy with blond hair and a twinkle in his blue eyes, one who loves swimming and supporting the South African Cricket Team. 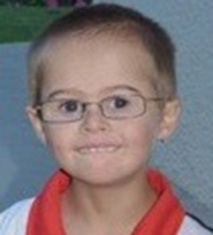 Daniel however suffers form Muscular Dystrophy. 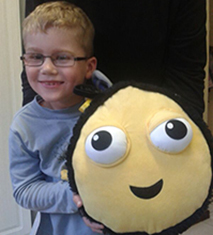 The Bumble Bee Fund donated towards an electric wheelchair for Daniel. Is a real go-getter and out to make the most of life. She is now 15 years old and suffers from Spinal Muscular Atrophy. She has recently had an operation on her spine and is slowly recovering. Kerry and her family have huge ongoing expenses. The Bumble Bee Fund contributed to Kerry’s medical expenses.